In an active/active group, all servers are active processors; they also serve as the backup server for resource hierarchies on other servers. For example, the configuration example below shows two active/active pairs of servers. Server 1 is processing AppA, but also serves as the backup server for AppX running on Server 2. The reverse is also true. Server 2 is processing AppX, but also serves as the backup server for AppA running on Server 1. Servers 3 and 4 have the same type of active/active relationships. Although the configurations on Servers 1 and 2 and the configurations on Servers 3 and 4 are similar, there is a critical difference. For the AppA and AppX applications, Servers 1 and 2 are the only servers available for grouping. They are the only servers that have access to the shared resources. 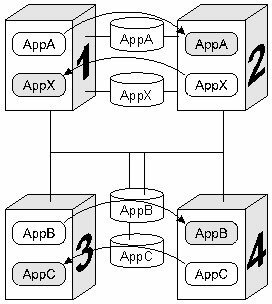 AppB and AppC, however, have several grouping options because all four servers have access to the AppB and AppC shared resources. AppB and AppC could also be configured to failover to Server 1 and/or Server 2 as a third or even fourth backup system. Note: Because SIOS Protection Suite applies locks at the volume level, only one of the four systems connected to the AppB and AppC disk resources can have access to them at any time. Therefore, when Server 3 is actively processing AppB, those disk resources are no longer available to Servers 1, 2, and 4, even though they have physical connections.